In the world of online workplace conversation, here are plenty of options — in addition to Google Hangouts and individual chat clients like Pidgin or even AOL Instant Messenger, chatrooms aimed at the corporate world like Campfire and Yammer jockey for relevance in office culture. Flickr Co-Founder Stewart Butterfield and his team at Tiny Speck are entering the fray with Slack, a mashup of chatrooms and collaborative sharing tools that are meant to do away with redundant conversations in multiple places. 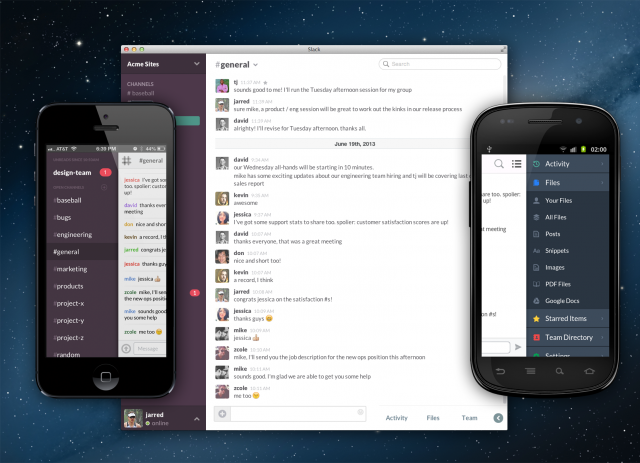 Slack was born out of a pivot, after Butterfield’s previous project, an MMO entitled Glitch, failed to gain traction. With the goal in mind to circumvent the slow conversations of email, Slack can be access via desktop or mobile and sorts every message into designated “channels” with hashtags. The app offers both group chat and private messaging as well as integration with a number of productivity apps including Heroku, Dropbox and ZenDesk. It also archives every chat and makes it searchable through a single toolbar, so important conversations don’t get lost in the shuffle. Ideally, it’s intended to work with small-to-medium sized companies with under 150 employees, according to All Things D.
While it’s possible that Slack will be a paid app later on down the road, it’s currently free to try. More collaborative work tools from Butterfield and his team are expected in the future, creating a comprehensive suite to filter and parse the continuous noise of a bustling office.